You edit video by arranging clips on the timeline. A transition is the change from one video clip to another. Video Edit Magic provides over 100 transition effects (often just called "Transitions") that let you control the look, speed, and feel of the change from one clip to another. Some transition effects also allow you to combine two clips into a single picture, for instance Picture-in-Picture and Green Screen transitions. Video Edit Magic's Timeline has two Video tracks. There must be video clips on both tracks to use transitions. A transition connects two scenes. It is always performed on a pair of video clips. If you just have one video clip, you can split it and place a part on each of the video tracks. Refer to the article Editing Techniques to remove unnecessary footage for help on splitting a video clip. Video Edit Magic provides Transitions to help you give style and flow to your videos. The number of ways in which you can use Transitions is limited only by your creativity. Once you are familiar with the basic process, allow your imagination to take over and create some truly personal and unique videos. Transitions are present under the Transitions tab of the Collections window. JPEG Image Wipe: In this case, a JPEG image file is used as an intermediate stage between the two video clips. The first clip dissolves to the image, and then the image dissolves to the second video clip. You can choose any JPEG image for the intermediate image—it does not have to be in the Media Collection. 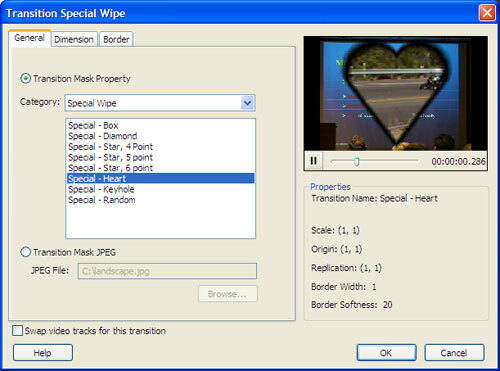 Matrix Wipe: In a Matrix Wipe, the new image replaces the old one in a moving pattern. For instance, with a Clockwise Matrix Wipe, the new image fills in more and more of the screen in a spiral pattern (in a clockwise direction). There are over 30 possible Matrix Wipes, including diagonal, horizontal, vertical, and various spiral patters. Chroma Key Color: You can remove a color from an image to reveal another image behind it using Chroma Key Color. Any color you wish to exclude can be made transparent and used to superimpose videos. This transition is described in detail in our article on the Using The Green Screen Technique. Luminance: The luminance transition gradually "fades" the first video clip out and fades in the second. The colors in the first clip are gradually lightened while the colors in the second start very light and gradually darken. Picture Arrange: Two videos can be played side by side using this transition. The screen gets shared by two videos which can be arranged diagonally, vertically, horizontally etc. You can specify any Background Color as a backdrop to suit the videos you positioned adjacently. Corner of one video can be overlapped by other; the video tracks can be swapped and videos rearranged by just opening the Transition Properties dialog for Picture Arrange Transition. The procedure to open this dialog for any transition is similar and is explained later in this article. Although the Transition names are self explanatory, you still might want to see a preview of what a particular Transition can do. To watch a small preview, simply right-click on the Transition icon and select Preview from the menu. The small preview window under the word Collections will display the Transition. Let us try adding the Special Wipe Transition between two video clips. This transition wipes off the first video clip and gradually introduces the second clip through a variety of selectable shapes like Stars, Rectangles, Key holes etc. Position the seek slider on the Timeline where you would like the Transition to start. Generally, this would be near the point where the two videos start overlapping. Select the Transitions tab in the Collections window. Right-click on the Special Wipe transition icon and then select Add to Timeline. For a transition to work correctly, you must place it between the 2 overlapping sections of the video clips present in the 2 video tracks. In this figure, the end portion of the video in ‘Video 1’ overlaps with the beginning portion of the video in ‘Video 2’. The Special Wipe Transition is on the Transition track between the overlapping parts of both videos. Cross Fade is a commonly-used transition for scene changes. It isn't as flashy or noticeable as a transition like a Matrix Wipe. Before applying a cross-fade, you must have a video clip in video track 1 and another in video track 2. Apply the transition between the overlapping sections of the two videos. Move the Seek Slider to the point on the Timeline where the two videos begin to overlap. Select the Transitions tab of the Collections. Double-click on the Cross Fade transition icon to launch the transition properties window. You can modify all the settings shown above. For instance, if you wanted to use a different type of Wipe Transition, like the heart wipe, you would just select it from the Category dropdown. If you want to transition from video track 2 to video track 1 (instead of the usual 1-to-2 order), select the option Swap video tracks for this transition. The Preview screen in this window can be used to see how the transition looks with different settings. You can change the duration of a Transition (the length of time it takes) by simply clicking the mouse on the right edge of the rectangle and dragging it. Try not to use too many different Transitions through out the video. Remember, Transitions should never be the main attraction. Using too many transitions can make the video appear garish and tasteless. For corporate videos, it is better to avoid using jazzy transitions which might take the focus away from the main topic. Leave the wipes aside for another day, and try a fast cross fade or random dissolve. The idea is to blend different sections of the video gracefully without distracting the audience. The Chroma Key Color Transition can put characters and objects from a video clip in a completely different setting. This effect is a Hollywood favorite. For home videos, try experimenting with different Transitions and settings to create a memorable movie. You will be surprised by the sheer number of ways a Transition can be adapted to change the look of your video. Transitions like Picture-in-Picture will convince your viewers that you are a pro. So much to choose from and so easy to use- Video Edit Magic.